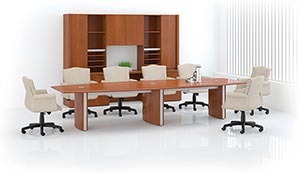 Paoli's Overture, an executive furniture series for meetings and remote training or conferencing in cherry and maple. 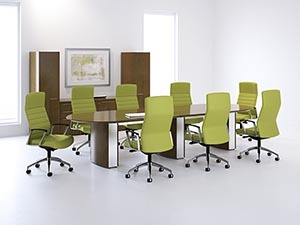 Overture includes tables, modular storage and specialized casegoods in a highly adaptable selection of shapes, sizes, trim levels and capabilities. Delivery and Installation available nationwide call 856-368-9085 for more info. 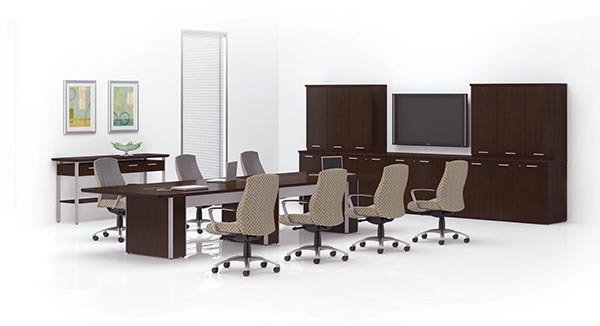 All Overture Series from Paoli Office Furniture is currently on sale for 50% Off. Take half off of List Prices shown. Call for pricing and component options. 856-368-9085 Tell us what you need and we'll put together a quote for you with the Overture Series collection to meet your requirements. 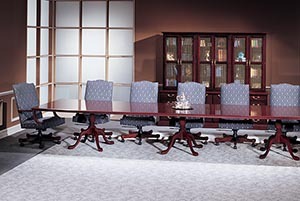 Traditional boat shaped conference table with queen anne bases and conference cabinet. 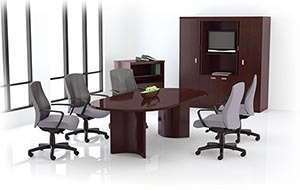 Racetrack conference table with buffet and storage cabinets. Delivery and Installation available call 856-368-9085 for more info. All Paoli is currently on sale for 50% Off. Take half off of List Prices shown in PDF Price Book. Overture embraces the technologies that support collaboration, increase productivity and reduce travel. 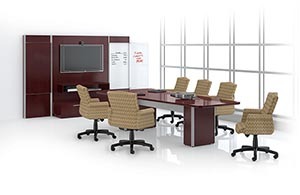 Having conference rooms ready on a moments notice provides a competitive advantage. Boat shaped conference table with wall unit. 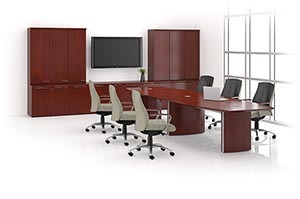 Rectangular conference table, lateral file storage cabinet and presentation cabinet. Overture is complete, with more than conference tables. The selection includes lecterns, serving carts and modular components for storage, display and teleconference equipment. Overture 10’ Video Conference Top in NT trim with QB edge and coordinating base, all in Light Cherry. Slingshot Executive Tilt Swivel Chairs in Davenport “Bark” leather and “Graphite” mesh. 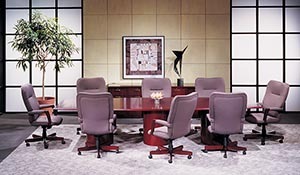 Rectangular conference table with round bases and buffet cabinet. 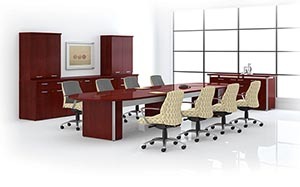 Traditional rectangular modular conference table enables you to create the length of table for your needs. 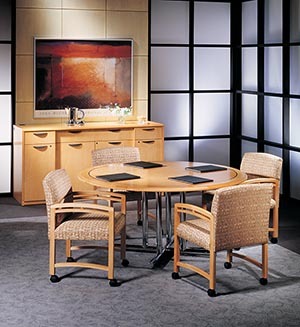 Round conference table with buffet credenza. 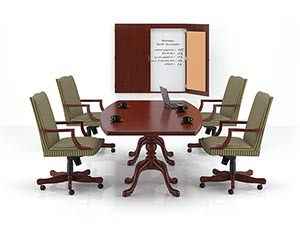 Traditional boat shaped conference table with presentation cabinet. 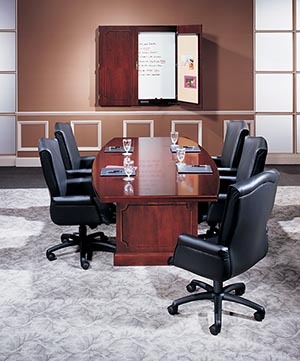 Racetrack conference table with half round bases, audio/visual cabinet and wardrobe/storage cabinets. Contemporary boat shaped conference with buffet credenza and storage bookcases. Overture 16’ Racetrack Top in CT trim with QB edge and coordinating base, all in Light Cherry. Omage Executive Tilt Swivel Chairs in Beat Box “Beach” upholstery and “Black” mesh. Overture 12' boatshape top in NT trim with CF edge and coordinating base, all in Honey Maple. Slingshot executive tilt swivel chairs in Bravo Alfalfa upholstery and Black mesh. Overture 14' rectangular top in NT trim with QB edge and coordinating base, all in Espresso. Omage management tilt swivel chairs in Pictogram Tonic upholstery and Graphite mesh. Overture 10' video conference top in NT trim with quarter bullnose edge and coordinating base, shown in Cordovan Cherry. Maxim traditional management tilt swivel chairs in Couplet Brown Sugar upholstery. Voice, data and web integration is possible for Overture tables of all sizes and shapes. Overture 48" square top in CT trim with QB edge and coordinating base shown in Espresso. With the veneer skin removed, the Overture base reveals a spacious interior for cabling and devices. As the trough doors close flush with the top, they leave cabling vents to minimize clutter. 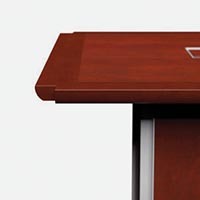 When not in use, Overture's capabilities appear as unique trim features integrated into the tabletop. Access to the trough and power/data connections is easily and elegantly handled. Hinged doors, matched to the tabletop's veneer and finish, open into the trough, providing more than adequate working space for making needed connections. the trough can be purchased from Paoli. Below the surface the Overture base structure for tops 72" and wider conceals a spacious trough connecting the base structures. The trough is wide enough for a large quanity of wiring. 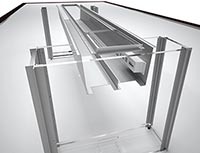 Through its access doors, the trough allows storage of smaller data projectors or telecom units. 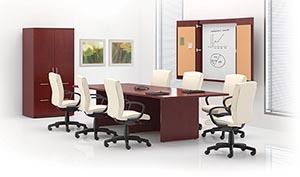 The number of access doors corresponds to the table's size, providing outlets within easy reach of all participants. With the lightness of a console and the function of a buffet, the Hospitality table is a welcoming addition to any space. Drawers for storing serving utensils and serving items, plus a lower shelf. At 36" high, buffet credenzas provide convenient serving height. Choice of drawer/door configurations, and can be combined with other modular cabinets from the Overture selection. Modular wall units include base cabinets in a variety of drawer/door combinations, upper bookcases with doors and open upper bookcases. Upper bookcase cabinet tops provide a finished, refined appearance. 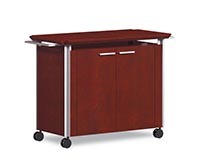 With the Serving Cart easily move food, beverages and serving supplies from kitchen to conference room or office. 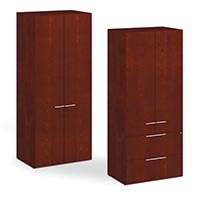 Wardrobe and lateral file drawer audio/visual cabinets help create wall units to cover entire wall. 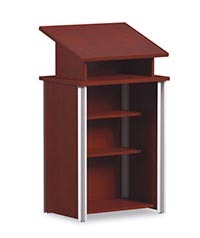 The lectern has a small footprint but accomplishes its task in big ways. The expeertly finished veneer surfaces conceal two storage shelves, plus a storage niche below the copy shelf. Overall height is 49"
Genuine flat sliced, slip matched cherry or maple veneers on all surfaces to provide proper consistency. On tops where technology is specified, quartered veneer is used. Different wood species offer unique texture and grain. Minor variations in finish color may occur due to the natural characteristics of wood. Paoli carefully selects all material used in every product insuring a commercially acceptable color and finish. Door and drawer fronts are slip matched cherry or maple veneer to match the tops and overlay the chassis. Chassis are assembled with dowel construction for precise tolerances. Units have solid hardwood parting rails and are reinforced with hardwood cleats and glue. All base units have adjustable leveling glides to compensate for uneven floor surfaces. Chassis panels are .75” thick with a 3-ply balanced construction and a heavy duty backer. All panels are constructed around a 45 pound density particleboard core. 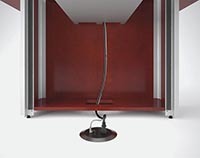 Overture bases have removable side panel for wire access and cable management. Access holes in top and bottom for wire access. Bases include adjustable levelers to compensate for uneven floor surfaces. Optional power centers are available which can be mounted over bases. Overture offers a wide range of bases that accommodate technology through power center and trough systems. When technology is specified, troughs are attached to the underside of the top and fit into bases to route cables discreetly, as well as the utilization of access doors in the tops providing easy access to troughs. Specifying technology in the worksurface provides the cut out and access doors. Electrical componenets must be ordered separately.